OHP is pleased to announce the addition of Kalmor® Fungicide/Bactericide to its line of quality biosolutions™ for ornamental growers. Available through authorized OHP distributors, Kalmor is an OMRI-listed, copper hydroxide-based fungicide that is labelled for use on a range of vegetables and herbs grown in greenhouses, shadehouses, and nurseries, for control of many problematic fungal and bacterial diseases. “Kalmor is a high-quality formulation with smaller particles than other copper-based products,” says OHP Manager Technical Services Dr. Carlos Bográn. Kalmor is effective against resistant strains of certain diseases, making it an ideal choice in an IPM program, adds Dr. Bográn. As with any copper-based products, users should check compatibility with other products before tank mixing. 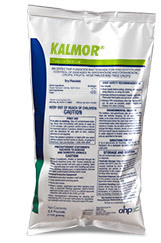 Kalmor should not be tank-mixed with OHP’s Areca® Fungicide or other aluminum-based products. OHP biosolutions is comprised of products that are specifically designed to address the growing segment of green growers, who focus on non-chemical or softer means of pest control. For more Kalmor information, including Label, SDS and product information click here.